Sunstate Blinds and Shutters provides custom design and installation of Vertical Blinds. Vertical blinds are a great way to add an elegant look to any room. Fort Myers provides residents with sunshine all year round and wonderful temperatures. Veritcal blinds are a great way to see the beauty of the Fort Myers outdoors. We can custom fit your vertical blinds to any size and color for you. Our professional staff is here to assist you to make sure we create the look you want. We can custom fit any of our vertical blinds to match any window size or shape. At Sunstate Blinds and Shutters our main goal is to make what you want. Vertical blinds are a great choice for covering windows and doors in your home. 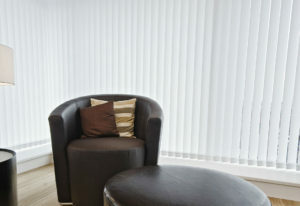 When vertical blinds are in their open position they can be kept tight to one side, allowing a beautiful of the outside. They are also a great source for blocking light into the room and adding a sense of privacy. We offer some of the largest selections in Fort Myers and Naples. Sunstate Blinds and Shutters offers custom color, textures and fabric. Our professional installers can fit to any window type and size. With one of the largest selections of Vertical Blind colors, patterns, trims, valances, and controls in the Fort Myers and Naples area, you are sure to find your perfect match for your home or office. Call us today to schedule a free consultation.